While choosing the right gauge and the right design for your gauge is important, it is equally important to choose the right glass. If the annular edge sight glass on your equipment has been damaged, Gage Glass provides replacement glasses that will suit your needs. 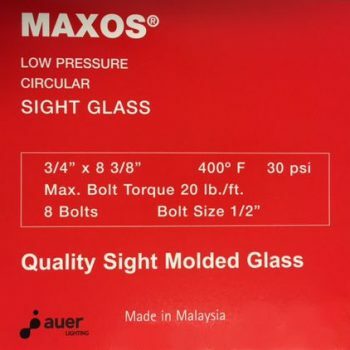 The Maxos® replacement high-pressure and low-pressure molded sight glasses allow you to easily replace the broken or cracked glass on your equipment. Gage Glass supplies these annular edge replacement glasses that can replace Pyrex® brand glasses that are no longer manufactured. The low-pressure Maxos® replacement molded sight glass is made for applications that do not exceed 400 degrees Fahrenheit. The glass is designed to withstand temperatures at every level below this, while giving you clear visibility and clarity. The glass is also manufactured to optimize safety and reduce injuries to boiler operators. 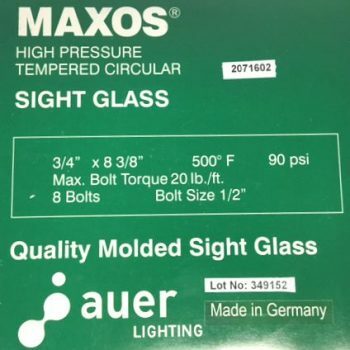 High-pressure Maxos® molded replacement glass is similarly constructed, but it is made for applications that exceed 400 degrees Fahrenheit. Both glasses are also subjected to extreme testing – up to eight times the pressure they would normally be exposed to – to ensure user safety. Maxos® replacement glasses are the only suitable replacement for Pyrex brand annular edge sight glasses, which are no longer in production. Learn more about Maxos® high-pressure or low-pressure annular edge replacement glasses below. If you are not sure if this product is right for your needs, contact Gage Glass by calling 800-780-3776 and a representative can help you find the item that you need.